Walking around Greenwich Village and the West Village is always full of authentic New York sightseeing. Each block holds their own specialties with shoe and clothing stores, plus food! A favorite of mine is Pasticceria Rocco on Bleecker St for their scrumptious lobster rolls. 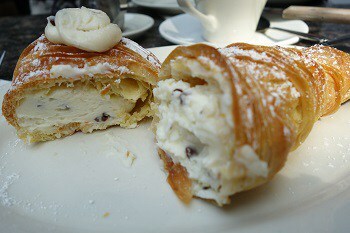 I also indulged on this flaky Italian pastry filled with cannoli cream and chocolate chips. Delish. 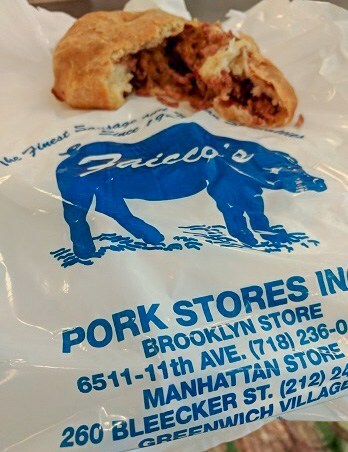 Protein was next at Faicco’s Pork Store. $3 bought me a hot out of the oven roll loaded with prosciutto. Good thing we have been walking alot!